Functional fitness is all about training your muscles to help you function outside of the gym. It means working out to be adaptable, dynamic and ready for whatever the world has to throw at you - like those heavy grocery bags that you have to carry up 2 flights of stairs! Functional training involves multi-directional, multi-joint and multi-muscle exercises to get your whole body working together. The keys to being functionally fit are muscle strength, balance and agility. By doing exercises for these key areas you will get a bonus benefit of core stability! 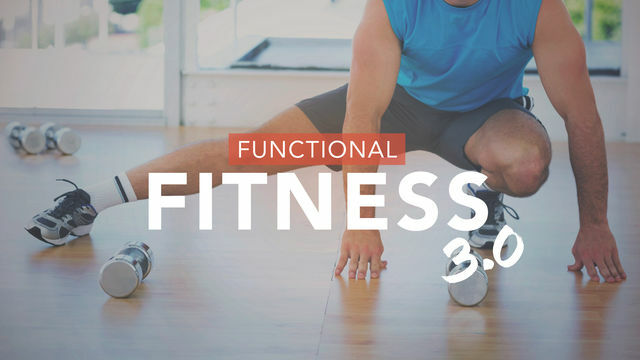 Functional Fitness 3.0 takes it to the next level with some advanced exercises that will be sure to challenge your body and mind. For the exercises using dumbbells, challenge yourself with your weight selection, however be sure you keep solid form for the entire duration of the exercise. Let's get functional!